Ticket to Ride Pocket offers 4 different playing modes, all on the original US map: SOLO; PASS-and-PLAY on a single device; LOCAL play between multiple iPhone, iPod Touch and iPad devices over Bluetooth or Wi-Fi and a MULTI mode feature incorporating iOS Game Center asynchronous play support (on iOS 5). It's the perfect “spur-of-the-moment” mobile gaming experience, making it possible to enjoy Ticket to Ride any time, anywhere! Ticket to Ride Pocket is compatible with iPhone 3GS, iPhone 4, iPhone 4S, iPod Touch (3rd & 4th generation. Requires iOS 4.2 or later. And, I do like Ticket to Ride: Pocket. Being relatively new to using the iPod Touch, I was highly skeptical of how well a boardgame would work on it. When I first tried it, I had heard of great boardgaming apps, but normally the stories at the time were primarily based on iPad games. I’ve had countless (well, countless by me, I’m sure the iPod probably tracks it somewhere…) hours of fun (and a little frustration going after some Achievements) with Ticket to Ride: Pocket. Ticket to Ride: Pocket is exactly as its name implies, a version of the Ticket to Ride boardgame that you can carry around (with your iPhone/iPod Touch). All of the expected gameplay is there, with no rules tweaks to confuse the gaming veterans. The tutorial will get people new to the game ready to go quickly, no need to open the (small) rulebook. I’m still amazed how playable Ticket to Ride, with its large board, is on an iPod Touch. The graphics are sharp, and the layout very readable. I assumed that I would spend much of the game zooming in and out (a feature that exists – and Le Havre sorely lacks), but in reality I almost never need to. The card display and routes are well designed, allowing play without any worries of the small screen. In fact, there are two regular gameplay features I really like in Ticket to Ride: Pocket that I miss in face-to-face games. 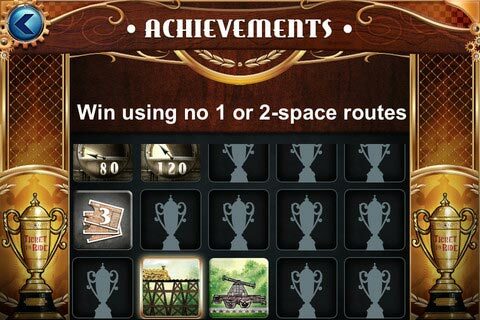 1) Highlighting of destination cities – During your turn, the cities you have destination cards for are highlighted, allowing you to see at a glance how far you are from completing everything. There’s no need to keep looking back at your tickets. The lack of need to look at tickets is a good thing, as I find scrolling through the destinations I already have to be more of a pain than I would like. This is a spot where the limited screen space comes into play. Thankfully, the highlighted city endpoints make up for this more difficult usability. 2) Opponents last action/cards taken shown – There are small sections at the top of the screen showing each opponent with a good deal of information (cards in hand, trains remaining, destination tickets held). One great thing is the display of what a player did on their last turn. If they took cards, which cards they took are shown (face up cards’ color are shown, face down cards are shown as face down). If they claimed a route, an icon shows this and the trains on that route are animated, and getting new tickets is also identified. I’m also a fan of the Achievements. When I play video games, especially RPGs, I tend towards trying to complete everything. The Achievements give me this feel (though the numbers for Games Played Achievements are a little ridiculous). The Achievements give you something to shoot for, and keep the game interesting as they can force you out of your typical play style. The AI is good enough to keep you interested. Four different versions are nice, ranging from nearly incompetent to strong enough that if you don’t pay attention, they can grab victory. The AI levels are not only based on difficulty, but the play style changes as well, making it feel like you’re against different types of opponents. For the price, I’d highly recommend anyone with a device that will play this app to give it a try. From time to time it will drop to $0.99, or even free, so if you track apps, add this one to your list. Whether using the Pass-and-Play at the airport or on the train, or filling 10 minutes while waiting in line, Ticket to Ride: Pocket has proven itself a great use of $2. •	The artwork is great. And this carries over from the game, but even more, they went the extra mile in the little things. For instance, each train as it is placed on the board has its own shadow and it positioned on the board. So a train going east has a different shadow from one heading northeast. •	There are lots of options for play. You can play by yourself, pass and play, play online, play with two bots, play with four. Whatever you choose. •	The bots are smart. They programed them to make good decisions. They know to take certain routes such as HOU to NO right away or you’ll have to pay for it later. The same with other routes. •	Fast play is great. You can get a game in in just a few minutes. This is nice because it allows you to test out some different strategies that you may not try in a real game. •	The accomplishments are hard. There are a good number of accomplishments that seem really tough. For instance, don’t use one or two spaced routes. It can be hard and egg you to keep playing. •	Don’t care for drawing tix. From a usability point of view its one too many clicks to draw new tickets. I know its small, but it kind of makes me crazy. •	Girlfriend yells at me for playing too much. So obviously the pros far outweigh the cons here. This is a great little game that works for all sorts of people. Even people I know who are not big fans of Ticket to Ride enjoy the quick version on their iphone. If you’re wondering about if this would work for you go for it, you won’t be disappointed. Side Note: It would be sweet if they released some of the additional maps, but some of different play mechanics would have to also be adjusted. Great pace. I can play a single player game in 10 minutes. Menus are annoying. There is one screen to many to get to the game, and that screen is a constant advert to buy the Europe version and expansions. Either both maps US + Europe or both the US map and 1810 expansion should have been included at the base price. I feel nickel and dimed once I get into the game. W/O spending more, the single player replay diminishes. But, pros really outweigh the cons. Recommended if you like the board game, for sure. I just bought this yesterday and all I have to say is WOW! The interface is flawless, the game play true to the board game and the AI opponents are challenging. Definately worth my investment. If you’re here I don’t have to tell you about how great a game Ticket to Ride is. This digital version is the next best thing to the physical board game. I’ve played about 10 solo games so far and I can’t wait to play my next one. As I am getting up to speed (it’s been awhile since I’ve played) I watched the video and went through the Tutorial to freshen up on the rules and then jumped right in. I’m only playing 1 on 1 but the game supports upto 4 AI players. 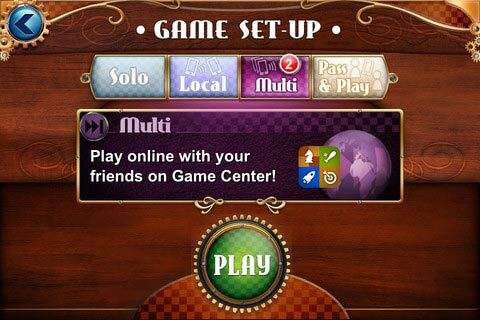 There is also Pass & Play, Local Multiplayer (device to device over wi-fi) and Multiplayer via the Game Center. The in-app store has the the 1910 Classic, 1910 Mega, and 1910 Big Cities variants for $.99 – for all three. 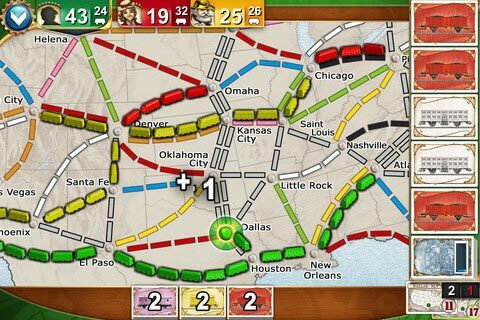 If you already love Ticket to Ride and you’re considering picking up a new game for your phone, look no further. My friend told me yesterday that Ticket to ride was currently free at the app store. I was always uncertain about ticket to ride, it seemed too simple to me, but hey a free game is a free game. I received so much more than I expected. Not only is ticket to ride a great game itself, (which I may not have discovered without this app since I had convinced myself it was too simple and didn’t have any friends who owned it) but this is a beautiful adaptation. It comes with a great video, an extremely helpful tutorial, and fantastic animations that help you track your progress. As others have mentioned the AIs are competitive, and I have to struggle to keep up at times. I love the asynchronous play option which is currently not available in the iPad version. This is going to be a lot more fun to have a couple games going with than words with friends. Overall I’d say it’s still well worth the $1.99 when this app is no longer free. I hope you enjoy it. Having owned Ticket to ride Europe in the past I was looking to get the original ticket to ride. If you want some filler 1 player gaming well look no further than the Digital copy! You can play against 1 to 3 other computer run opponents. I don’t need to tell anyone how this plays as you ALL know! Great scoring updating and a whistle when it’s your turned is sounded. The laying of the tracks can be a bit fiddly on the i-phone (which is what I play it on) but ok – It looks fantastic and is a really good conversion! If I was going to have a game night though I think I’d play the physical board version. A must have for any ios Gamer. This implementation of Ticket to Ride gives you access to the game in a cheap and easy format. Play local, network, solo, or pass and play all while seeking out those elusive achievements (like score 240+ points!). It has it all (except many of the expansion maps which will hopefully come soon probably via in-app purchase). Don’t walk, don’t run, but hop on your next available train to pick up this fabulous app! 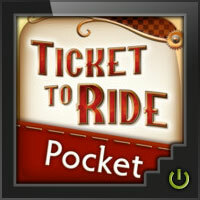 Add a Review for "Ticket to Ride Pocket"